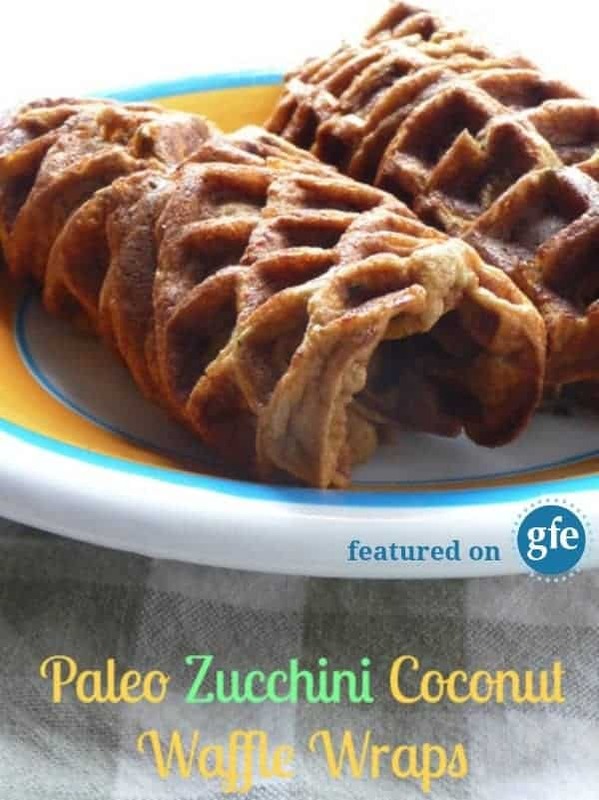 Today I have the pleasure of sharing another recipe from my talented friend Iris Higgins—Paleo Zucchini Coconut Waffle Wraps. (Read more about Iris at the bottom of this post and grab her free ebook of her best recipes here.) I think wraps are terrific year round and waffle wraps are even better! Everybody loves waffles and they make a really wonderful “bready” option. I have personally used waffles in place of bread for some truly amazing sandwiches from time to time. One of my favorite waffles for sandwich “bread” is actually my version of another recipe that Iris created. However, I love these Paleo Zucchini Coconut Waffle Wraps even more than that recipe because they’re grain free and are a great way to use zucchini. Hey, we’re always looking for better ways to include veggies in our meals, right? Plus, even after refrigeration, these wraps are perfectly pliable and delicious. You can fill these waffle wraps with savory or sweet options. Iris supplies some tasty filling suggestions in this recipe. Personally, I’m always happy to simply enjoy these wraps with my favorite traditional sandwich fillings, like chicken salad, ham salad, tuna salad, ham and cheese, and the like. By the way, Iris takes an extra step in this recipe—but it’s a very worthwhile one. She separates the eggs for this recipe. Separating the eggs and beating the egg whites before folding into the batter always yields a far superior waffle. Make this recipe and you’ll see! For many more excellent wrap and tortilla recipes, check out the Top 30 Best Gluten-Free Tortilla and Wrap Recipes from my Bountiful Bread Basket series. Simple and pliable, these waffle wraps work great with savory or sweet fillings. diced sausage and sauteed veggies. In a large mixing bowl, whisk together the coconut flour, cinnamon, baking soda, and sea salt. Stir the egg yolk into the dry ingredients, separating the egg whites for later. Stir the coconut oil, maple syrup, and zucchini into the dry ingredients as well. With a hand mixer, whip the egg whites until stiff peaks form. Stir gently into the batter until completely mixed (no lumps). Make waffles as directed with your waffle iron. The waffles will be soft and pliable. Fill however you like and roll up to eat. Can be refrigerated and eaten cold. They will remain pliable after being in the fridge. Wow, is this a welcome recipe! . My grandchildren will love this, and I love that it is grain free!! Definitely the coconut cream and fresh fruit filling!! Thanks for sharing Shirley. Ha! I love that you made these waffles into wraps! Great use of coconut flour. Hi AZ–Welcome to gfe! Well, Iris of Your Fairy Angel is the one that created this genius recipe, but I’m sure she will appreciate your kudos! 🙂 Btw, your Flourless Chocolate White Chocolate Macadamia Nut Protein Cookies look and sound wonderful! I am amazed at how flexible these waffles are! I would like to try them! Hi Julia–Good to see you here at gfe again! Yes, these waffles are fantastically flexible and wrap ready. 🙂 Love your latest recipe, Purple Power Plum Pancakes! I’m an alliteration gal 😉 and those sure do seem like a good way to start one’s day! 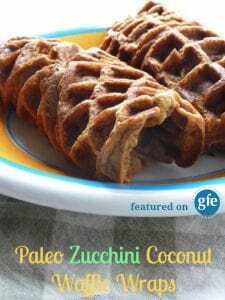 Paleo zucchini coconut waffles looks delicious, thanks for sharing with Hearth and soul blog hop. pinning and tweeting. Hi Swathi–Yes, these are delicious and make a great base for both savory and sweet wraps. Thanks for all the sharing!